I believe that Ethiopian cuisine makes a credible claim to be considered an equal among the world's many diverse and celebrated culinary traditions. Yet many people have never experienced the succulent rich blend of flavors that characterizes Ethiopian cuisine. 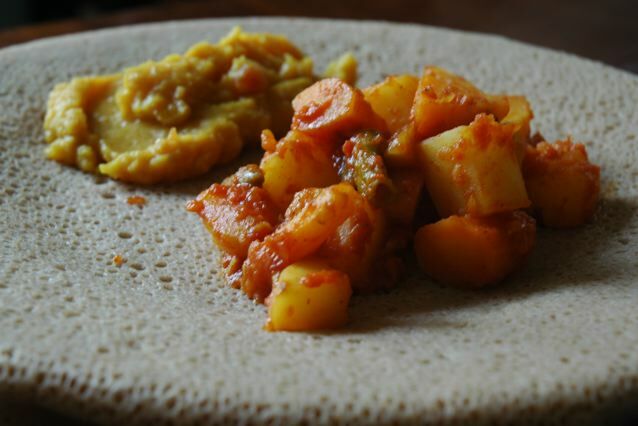 Even better, Ethiopian cuisine, when prepared at home with methods that conserve on oil, offers a flavorful and interesting set of tastes that are satisfying, filling, and incredibly healthy. I first learned how to cook Ethiopian food at home thanks to a colleague of mine, an Ethiopian graduate student. She taught me to prepare the dishes in that famed old world style of cooking where measurements are more a matter of "just enough of this" and "not too much of that." We sat around the kitchen talking like a couple of old ladies while the velvety smell of onions smothered in oil filled the air. Also, true to practices in her homeland of obtaining precious calories through oil, her preparations of the vegetarian dishes was very heavy with oil. It was, to put it lightly, used in cups rather than tablespoons. These dishes have become favorites within my home because they represent such a welcome departure from the standard flavors of the American diet, and because they are so full of nutrition and low in fat and calories. You can have a satisfying, natural, flavorful meal of Ethiopian berbere potatoes, carrots and green beans for a better nutritional content than those skimpy, low-taste freezer-section diet 'meals.' Over the years of preparing these dishes at home, I have gradually discovered ways to minimize oil in the preparation without sacrificing too much taste. I have also standardized the process into a proper recipe with measurements. Because sadly you can't all come over and sit in my kitchen and learn through doing the way recipes were meant to be conveyed. Ethiopian cuisine is typically served 'family style' with many different dishes for the entire dining party served together on a large central platter. (In the photo above, these berbere potatoes are served with mild yellow split peas.) That platter is covered with spongy, slightly sour flatbread called injera (again, see photo above). The diner eats with her hands, using the injera to scoop up the savory dishes. If you live near an African grocer or Ethiopian restaurant, contact them to see if you can purchase injera conveniently. I am fortunate enough that I am able to purchase my injera from a local Ethiopian store that sells packages of three large (approx 14-16 inch diameter) freshly prepared injera for only $1.50. If you live on Chicago's northside, you can purchase injera at the same Ethiopian convenience store where I do. It is a small store that seems to grow out of the side of a Walgreens and Payless Shoes building at 6125 N Broadway St, Chicago. You can purchase Ethiopian spices and injera from the really helpful and kind Ethiopian man who operates the store. If you would like to make your own injera at home, there are recipes on the internet for a variety of approaches. For a very authentic approach with good explanation, see The Science of Cooking. Another recipe that relies entirely on teff flour can be found at Recipe Zaar. For more information on teff, check out this specialty page. If you cannot access authentic teff flour, versions of injera that do not use teff flour are also available if you search for them. Serves 6-8 as part of a multi-dish Ethiopian feast. Serves 4 as a main dish. Heat oil in a small saucepan over medium heat until hot. Add onion and cook stirring. If the oil sizzles and pops, reduce heat. But you want to maintain a flame still hot enough to caramelize the onion without being too hot to burn through the oil quickly. If the onion begins to stick or burn, add more oil. Continue cooking until it resembles the photo below and right. Remove the onion compote from the pan and set aside. Reserve the same pan with the onion and oil residue, do not clean. Skin the potato and carrots. Cut both into pieces of the same size, roughly 1/2 inch to 3/4 inch chunks. Under traditional cooking methods, you would fry both in plenty of oil until softened. To cut down on oil, I first steam the carrots and potatoes until they are a firm al dente (you can use a stovetop or microwave steamer, whichever you prefer). You want the potatoes to still be firm enough that they will not become mushy when cooked during the last stage in oil when building the sauce. 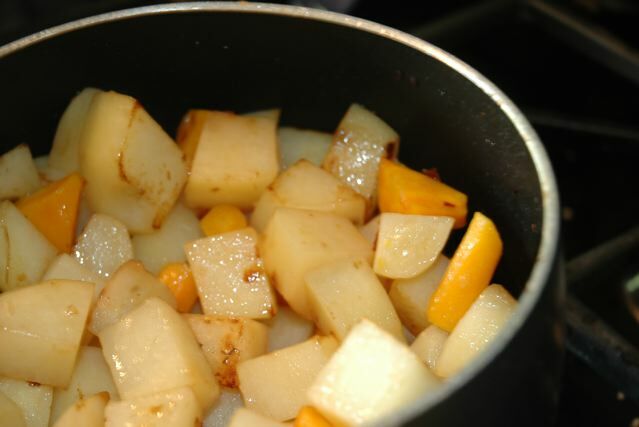 Once you have steamed the potato and carrot pieces to a firm al dente as described above, return the pot with the oil and onion residue to a medium flame. Add 1.5 Tbsp oil and heat. Add the potatoes and carrots and cook until the potatoes begin to brown around the edges and are al dente. If you are using fresh green beans, cut them into halves or thirds. Add them during the last three minutes of frying. If using frozen green beans, do not add them until the final ten minutes of cooking or they will become overly soft. Drain tomatoes. Blend 1 cup diced tomatoes in small food processor until smooth. 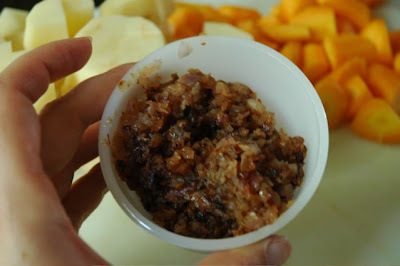 Remove 2/3 cup of blended tomato to a small dish. Combine with berbere seasoning and turmeric. The amount of berbere will depend on how hot you like the dish. Begin by adding 2 tsp and taste. 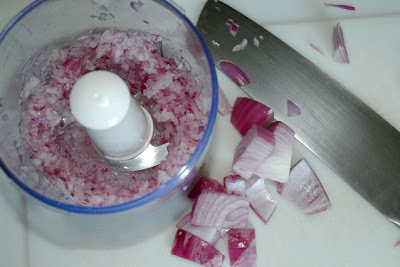 Add the reserved onion compote. Stir to combine. Fold the seasoned tomato mixture into the cooking potatoes and carrots. Stir gently to avoid breaking up the potatoes. Cook covered until the flavors are well combined and the potatoes and carrots are a soft al dente. 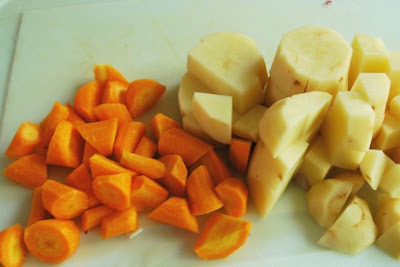 This final stage of the cooking time depends on how well steamed the potatoes and carrots were when they began. If you find you need to cook longer, add the remaining blended tomato to maintain a nice sauce. Seed the jalapeno and cut into approximately 8 strips. Stir the jalapeno pepper into the dish during the last 5 minutes of cooking. Salt to taste. Serve hot on fresh injera bread. 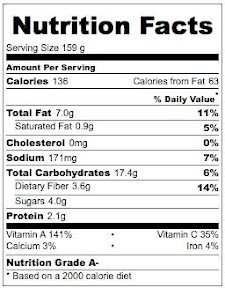 Nutritional Information (per serving, 6 servings). Includes green beans. Does not include nutritional content of injera bread. That looks delicious - I had Ethiopian food for the first time last winter and it seems so elemental - eat with your hands, everyone share. I loved it, and now I look forward to trying it at home. Oh wow, I'll have to make it a point to try some Ethiopian food! 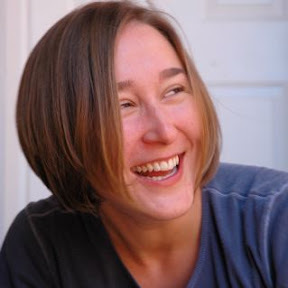 I am going down on my knees right here and now begging you to share any split pea or other legume, but especially yellow split pea, Ethiopian dishes you have from your friend. I have been searching forever for good ones. Erin, sorry I've been away so long. This sounds fabulous, and I especially appreciate the cultural insights. In some crazy coincidence I went out for Ethiopian food again last night - this time I was with a friend who had lived there for several years and he specified that we wanted teff-only injera: WOW. It's got a great flavor. There was also some special hot sauce that I don't recall the name of, but it was delicious. I think the best part is at the end of the meal when the injera is all soggy from the delicious sauces - yum! I've never had Ethiopian food and so welcome the opportunity to make them at home via your blog. Thanks! I just have to get berbere. Thanks for the information on Injera and Teff flour. Excellent read as usual. I sometimes get Injera from Shan foods near Sheridan and Broadway. Gotta check out that Ethiopian convenience store you mentioned. Can't wait to try this. We went out for Ethiopian last night here on Amsterdam and I said to myself, I just need to learn how to make this dish with the green beans! Thanks for doing the work of modernizing the recipe with regards to the oil. I used to live in Andersonville and would have been happy to check out the shop on Broadway. Gotta check out the rest of your blog! This is a good adjustment for the American. I need to criticize your calling it bebere potatoes though because you use too little berbere for any Ethiopian to appreciate. We like to put in at least 8 tablespoons in any berbere dish. Seeing as the "alcha dinich wit" (the proper name for this dish) doesn't even require berbere, I wouldn't recommend putting any. Your version sounds delicious though but to make it more authentic you can take out the green beans. There's another dish called "carrotna fosolia" which is just the carrots and green beans. Also you can add cumin to any "alicha" dishes (non berbere wots). It's a really nice addition. Also ginger is a great spice to add to any Ethiopian dish with a few exceptions.